Do you remember Gus Griswald (Griswold) from the cartoon Recess? Gus was a worry worry wart of sorts. In one episode he earned the nick-name Safety Man from the kindergarteners he had to watch during the recess time. Gus spent the whole episode saving the kindergartners from stuff kids do and a few hairy situations. 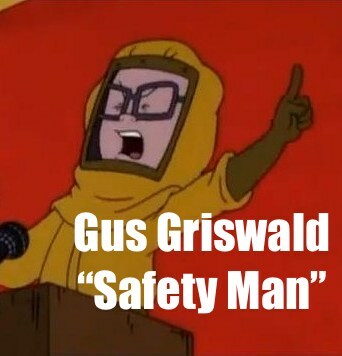 In another episode, Gus wants to get rid of all germs, preaching about their dangers, and wears a has-mat suit. Safety Man is a great moniker if you are taking care of small children but not such a great nick name if you’re a Youth Pastor, or a Christian. In my younger days I told myself I wanted to be the “most dangerous” Youth Pastor ever. I wanted our youth group to be the “most dangerous” youth ministry in town. When I say dangerous I don’t mean it from the “putting my self or our kids in harms way” perspective; but dangerous in the spiritual sense. I wanted myself and our group to be dangerous to the devil and to conformity. I wanted us to represent the dangerous side of Jesus; to say what needed to be said and do what needed to be done without regard to our own personal “safety” or to what others might say about us. But youth ministry, life Christianity itself, has become safe. In the discussions I have with youth pastors and I ask them what’s going on in their groups, they will tell me about all the programs and activities that are going on but nothing that says to me “Man, that is dangerous” . I am not saying that we should hand out scissors and have kids play tag. That’s a stupid kind of dangerous. Like the faction Dauntless from the book Divergent, I am not recommending we take needless risks that could get us in trouble or fired, although, if you are following Jesus this is not just a possibility but a reality. The kind of dangerous I am talking about involves becoming more like the Jesus of scripture and less like other youth groups. But, if you want to play it safe, let me offer you six ways to do it. 5. For God’s sake don’t ask kids to follow Jesus, just ask them to believe in God and come to church every week.